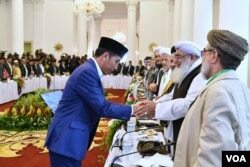 Religious scholars from Afghanistan, Pakistan and Indonesia declared terrorism and suicide attacks in Afghanistan and the region as unethical and against the principles of Islam as they gathered at a one-day conference in Bogor, Indonesia, to address violence in Afghanistan. Friday's conference was held months after more than 1,800 Pakistani clerics issued an Islamic decree, or fatwa, condemning suicide attacks and terrorism in all forms in Pakistan. Pakistan's conference was criticized by the Afghan government at the time, though, for condemning terrorism inside Pakistan only, and not also extending the religious decree to Afghanistan. Bogor's religious conference was seen as an effort to persuade Pakistani religious scholars, who have some influence over militant groups in the country, to reject terrorism not only in Pakistan but also in neighboring Afghanistan. That is where Taliban insurgents and the Islamic State terror group have increased their violence in recent months, killing and wounding hundreds of civilians. The Taliban and the Haqqani Network are said to be hiding in Pakistan and using Pakistani soil to train and launch terror attacks in neighboring Afghanistan. U.S. and Afghan officials have long accused Pakistan of being selective in its campaign against militant groups operating in the country and targeting only groups that threaten Pakistan's security. Pakistan denies the charges and maintains that the country has equally targeted all such groups. Without directly appealing to the Taliban, the Haqqani Network or IS, religious scholars from all three countries issued a 12-point statement Friday at the end of the one-day conference in Bogor and called on all warring sides to join direct peace talks with the Afghan government. Dr. Qibla Ayaz — a Pakistani participant in the Bogor conference and head of the Council of Islamic Ideology, a government advisory body — told VOA from the conference the religious scholars from all three countries were not focused on one single group in a single country, but rather on terrorism and extremism facing the region. Ayaz said the issue could not be solved by a single conference. "Certainly if this process begins, keep it rolling and make other counties part of it, then the situation will get on the right track," Ayaz said. Pakistan's Daily Times, an English-language newspaper, reported that the Taliban allegedly were assured ahead of the Indonesia conference that the militant group's name would not be mentioned in the conference directly. The Taliban have yet to react officially to the conference, but the group has rejected calls for peace coming from previous similar gatherings. Following Pakistan's meeting of religious scholars in January, Afghan scholars gathered that same month and issued a separate decree against suicide attacks and violence in Afghanistan. But militant groups in both countries have carried out dozens of terrorist attacks since the religious decrees. Ordinary Afghans seemed highly optimistic, though, about the religious conference in Indonesia. Samiullah, a Kabul resident, who like many Afghans goes by one name, told VOA that religious scholars could play a significant role in encouraging peace in Afghanistan. "These scholars should issue decrees against Taliban and all other groups and declare the terrorist acts as haram [forbidden] in Islam," Samiullah said. Farooq Hasnat, a Lahore-based international affairs expert, shared Samiullah's optimism. "The warring groups use religion to justify their acts, but a fatwa from a majority of religious scholars would have a positive impact and discourage the use of religion for the violent acts," Hasnat said. The religious scholars at the Bogor conference emphasized the need for peace, referring Muslims to read and follow the holy book of Quran and heed the practices of the prophet of Islam, collectively called "Hadith." The Taliban and other militant groups in Afghanistan and elsewhere in the region also refer to the two top religious sources of Islam for justifying their acts of violence. Hussain Yasa, the managing editor of Outlook Daily Afghanistan, said the Taliban also have religious scholars in their ranks who encourage them to violence. "Taliban have ulema [religious scholars] in their fold, too, so it will not be easy to convince them to renounce the violent acts," Yasa said. "They have their agenda and will act according to the ground realities." VOA's Behjat Gilani and Rahman Bunairee contributed to this report.